On December 21, 2012, fifty thousand members of the Zapatista movement, wearing their famed balaclava masks, silently assembled in the town of San Juan Chamula and marched south to the city of San Cristobal de las Casas. It was a highly symbolic gesture. San Cristobal sits in a picturesque, lush valley that has no room left to grow. In 1970, the city’s 32,000 inhabitants lived on 13% of the valley’s land. By 2002, 112,000 people lived on 98% of the valley’s land. The explosion was due to the influx of internally displaced Tzotzil and Tzetzal-speaking Mayans from the rural highlands of Chiapas, explains Jan Rus, an anthropologist that has witnessed the migration first-hand over the last few decades. Some of the first to come to San Cristobal were Protestants and reformed Catholics that fled sectarian violence in San Juan Chamula. That town’s leaders expelled 30,000 fellow indigenous peoples – half the town’s population – beginning in 1970, accusing them of upsetting a decades-old political and religious balance. Since the 1930’s, most federal aid to indigenous peoples in Chiapas flowed through the National Campesino Confederation (CNC), an organization setup by the PRI. The CNC’s representatives in places like San Juan Chamula decided how to implement agrarian reforms, or who would get federal loans, farm subsidies, or licenses to lucrative industries. License to sell alcohol, for instance, was only given to select Chamulan leaders. Alcohol played a central part in religious rituals in Chamula. One drink in particular, a rum called pox, is still consumed in large quantities during religious fiestas, baptisms, weddings, funerals etc. As a result, the license-holders wielded immense power. These were the men that would become Chamula’s caciques, politically connected indigenous peoples that ran the show. Not participating in the town’s traditional Catholic practices was seen as an affront to the town’s culture, and especially to the authority of the caciques, who had secured a monopoly over the sale of pox, Coca-Cola, and candle wax, indispensable products for traditional Catholic practices. The ruling party at the time, the PRI, looked the other way as the caciques delivered 100% of the town’s votes to them for most of the last century. Later, migration to San Crisotbal was spurred by a downturn in the region’s economy, which continues to have an impact on indigenous people in Chiapas today. “People who used to be migrant laborers can no longer be migrant laborers because there’s just too many of them,” says Rus. Since independence from Spain, most men in the highlands of Chiapas worked as migrant laborers on cattle ranches and coffee farms owned by mestizos. Chiapas’ economy tanked beginning in the 1980’s and 1990’s as world coffee prices fell, and an influx of Guatemalan refugees made work even scarcer. The federal government halted crucial subsidies for corn, and liberalized the economy to comply with free trade deals. The neighborhood of La Hormiga (literally The Ant Pile), was founded by displaced Chamulans in 1984. It is built on a steep hill that extends north from the Periférico, a road that rings the city of San Cristobal. 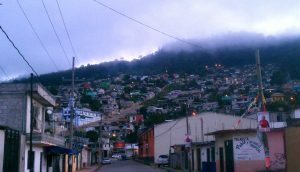 The hill’s name predates the neighborhood, but the names of other neighborhoods ringing San Cristobal follow a more telling pattern. Places like Nueva Esperanza (the first indigenous colony), Palestina, and Paraiso, were named by the Protestants that founded them. Older neighborhoods like La Hormiga have paved roads and running water, but the newest settlers live in abject poverty, housed in single-room structures made of tree bark and plastic. As late as the 1950’s, indigenous peoples were legally barred from staying overnight in San Cristobal. The first indigenous refugees built neighborhoods on largely unused land sold to them at inflated prices. During the first twelve-days of the EZLN rebellion in January, 1994, fighters from the Lacandon Jungle occupied San Cristobal with the help of the indigenous peoples, most of whom had long ago organized themselves to fight for their rights in the city. Organizations like the Council of Indigenous Representatives of the Highlands of Chiapas (CRIACH) were originally setup to enlist the Mexican government’s help in halting expulsions from San Juan Chamula. By the 1990’s, CRIACH had begun to represent the wider interests of migrants to San Cristobal, who had a difficult time getting land for housing, space in the city center for businesses, and enrolling their children in schools that barred them for religious or political reasons. Inspired by the Zapatistas, in February 1994, 285 indigenous organizations came together to form an umbrella group called the Consejo Estatal de Organizaciones Indígenas y Campesinas (CEOIC). One of the group’s first actions was to call for the occupation of mestizo-owned land, and in San Cristobal, hundreds of indigenous peoples invaded tracts on the outskirts of the city. A few months before the rebellion, around 800 Protestants had been expelled from San Juan Chamula, one of the largest of such single incidents in years. This time, instead of trying to find space for housing in the city’s outskirts, the Protestants took over a government office in the center of San Cristobal. In June 1994, inspired by the rebellion and accompanied by international journalists, the expelled Protestants returned to their homes under guard by Guardian de mi Hermano, a newly-formed Evangelical defense group. Campaign posters line the streets in La Hormiga (the Ant), the largest and one of the oldest indigenous neighborhoods on the outskirts of the city. Founded by indigenous people fleeing religious and political violence in San Juan Chamula, the leaders of these neighborhoods were some of the earliest and most crucial allies of the EZLN. Today, many have turned to traditional political parties, but some neighborhoods continue to support the Zapatistas. When I visited the Periférico during run-up to Mexico’s elections last July, candidates rode around in the back of pick-up trucks through the indigenous neighborhoods, announcing their promises to help residents over loudspeakers. Along with signs declaring areas to be part of the Zapatistas’ Other Campaign, houses in several neighborhoods displayed posters for candidates from a whole range of political parties and local alliances. A handful of neighborhoods, like 5 de Marzo (named for the date it was invaded), are entirely Zapatista-aligned. Tensions between mestizos and indigenous peoples over land continue in San Cristobal. A thousand indigenous peoples have occupied a large tract of land belonging to the Instituto Nacional Indigenista (INI), a government department once devoted to addressing their concerns. They argue it should be used for housing them, instead of being sold to private investors, as the governor had planned. A few months after last year’s elections, hundreds of indigenous people invaded the El Ellar ranch on the west side of the city. Police have had several violent confrontations with the occupiers, and scores of indigenous leaders have been arrested. Meanwhile, San Cristobal’s mestizos are pushing the city and state governments to displace the latest invaders. Each side has mobilized hundreds of supporters for marches and petitions.